Spinal fusion surgery is aminimally invasive surgical procedurein which two or more vertebrae in the spine are fused to reduce motion between the vertebrae that are elicitingpain. Spinal fusion surgery can beused to remedy a deformity or tomend a fracture. In addition, this surgery can be done to treat spinal stenosis, or the narrowing of the spinal column. AtNew EraSpine, spinal fusion is performed along with other surgical procedures, like surgery to take out bone or tissue that is applying pressure on the spinal cord and spinal nerves. It may also be done after surgery to stabilize the spine after a procedure to treat issueslike arthritis or a spinal tumor or infection. Spinal fusion spells relief. The most prevalent risk of spine fusion surgery that the newlyfused vertebraewill not relieve the lower back pain symptoms patients have been suffering from. This risk occurs in an average of 20% of spine fusion surgeries nationwide. The likelihood patients not receiving relief increases when three or more vertebrae are fused together. with fusions of three or more levels. This result is typciallyknown asas failed back surgery syndrome. There is also a risk of a condition calledpseudoarthrosis,whichiswhen the vertebrae doesnot fully fuse together after spinal fusion surgery. This condition occurin about 5-10 percent of spine fusion surgeries, however, this condition is much less prevalent. People who are smokers have a higher probability of having an unsuccessful spinal fusion surgery. If your surgeon uses pedicle screwsfor your spinal fusion surgery, there is a possibility that the screws may become loose or break, requiring more procedure to remedy the issues. Anterior grafts and cages can shift or subside, which may require repeat spinal fusion surgery. Once your spinal fusion surgery is complete, yourrecovery process begins with a 1-5 day stay at the hospital so they can monitor your progress. Pain medication will be administered regularly during the first couple days and will continue depending on your pain levels. At this time, your nurses will be monitoring your incision area, lightly squeezing soap and water onto it and drying thoroughly. Blood tests will also be done to monitor the oxygen levels because of your blood loss during spinal fusion surgery. If everything seems normal, the doctors will send you home to continue the healing process. These next few weeks after being discharged from the hospital will determine the success of your recovery. During spinal fusion surgery, your doctor does not necessarily “fuse” your spine at that time. Bone graphs are carefully inserted in places where they will grow and “fuse” together over the next several weeks. It is vital to the recovery process to KEEP YOUR SPINE ALIGNED CORRECTLY. The majority of patients are fitted with a back brace and work with physical therapists to learn how to move throughout daily activities in a way that minimizes any stress put on your back. It is highly encouraged to start the recovery process as soon as you leave the hospital to increase your mobility and regain your strength.Your doctor will recommend that you change resting positions frequently and avoid standing for an extended amount of time. Just like minimally invasive spine surgery, you are encouraged to take short walks, increasing in frequency and length gradually as your body permits you. If you are experiencing sudden bursts of dramatic pain, walks should be stopped altogether to give your spine has more time to heal. If you do not have someone to help you with these tasks during your recovery time, please consult your physical therapist or Dr. Moazzaz. At this time, most patients start to feel their strength returning to them, but also need to monitor their mobility and avoid most physical activity. moving with your back in mind will be part of your daily routine, but it is important to continue this routine and be mindful to not overexert yourself too soon. These next few months are what we mentioned as the most crucial healing months of spinal fusion surgery. Pain from your spine is usually ended after the first month, which is dangerous for those pushing to return to their normal routine. Others may experience pain for the next 3-6 months post surgery. It is important to listen to your body; when you are experiencing pain, it is telling you that it is not ready for the actions you are making. Once your spinal fusion surgery has had three months to ‘fuse’, it’s time for training and strengthening of your muscles around your spine. Progress is a key element in daily activities, which should be aware of and monitor during your healing process. It is highly advised to see a physical therapist who can provide at home workouts to you and monitor your recovery/hold you accountable for your progress. If you have not noticed your body progressing in range of motion and strength, please contact Dr. Moazzaz. Rest and monitoring your movement were important in the first three months after surgery. This stretch of inactivity after spinal fusion surgery leaves the backmuscles surrounding the spine weak as well as the patient’s overall condition. This loss of muscle and range of motion are common, so do not get overwhelmed by this change. The majority of your range of motion can be reached by proper exercise and training, so keep working at it. Patients are usually concerned hat they might damage the spinal fusion through exercise, but thisactivity promotes healing and surrounding muscle strength. 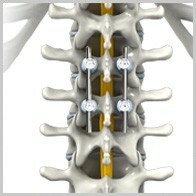 Once the fused spinal has set, it is no longer frail or brittle. Any stress that is put on that area at this time will only help it become stronger. Any type of twisting, bending or lifting should be avoided, but general exercise will only improve your spinal fusion surgery recovery. Cervical spinal fusion is performed to fuse vertebrae in the neck and address neck pain and radiating shoulder or arm pain associated with cervical issues. Types of cervical spinal fusion include both bone grafting and the use of metal implants as for lumbar spinal fusion. Spinal fusion ranks among the least invasive and most successful back pain surgeries on today’s medical scene. Through TLIF (Transforaminal Lumbar Interbody Fusion) Back Surgery, studies indicate that the patient’s pain is improved 60% to 70%; furthermore, about 80% of patients undergoing TLIF spinal fusion surgery are pleased with the results. Spinal fusion is asurgical procedurein which two or more vertebrae in the spine are fused together to reduce themotion of the vertebrae that are provoking pain. Spinal fusion surgery is administered to correct a deformity or totreat a fracture. This surgery can remedy spinal stenosis, or the narrowing of the spinal column. AtNew EraSpine, spinal fusion is performed in conjunction with other surgeries, such as surgery totake outbone or tissue that is applying pressure on the spinal cord and spinal nerves. It may be performed as a follow-up procedure to stabilize the spine in the wake of a procedure to remedy conditions like arthritis or a spinal tumor or infection. In short,spinal fusion surgery puts patients onthe road torelief. Spinal fusion maynot alleviate all back pain. If you suffered from chronicback painbefore spinal fusion, then lingering back pain may remain. Exercise and weight loss can enhance the results of your spinal fusion surgery. Based on yourcondition anddiagnosis, Dr. Payam Moazzaz can assess expectations for your treatment options. Please schedule your consultation today.